I would like to copy the client address to the Property address based on checkbox same as address. I have been reading an earlier post where you showed how this can be done using calculation fields and have altered my test form accordingly, However I cannot for the life of me figure how to apply the calculation fields to actually copy. Thank you for contacting us. 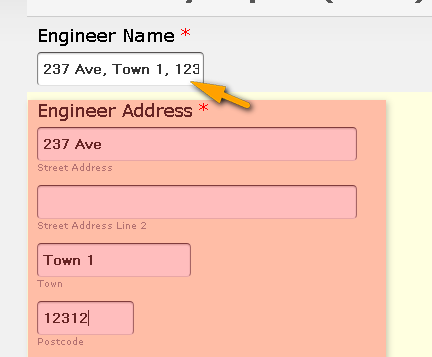 You may copy the placeholder name field and place it on the Calculate Field on another textbox. After getting the placeholder name you can place that on another textbox by accessing the same menu and click "Calculate Field"
I already have cloned that demo prior to asking this question to try and understand the logic of your copy fields but looking at the conditions does not help. The address fields for the client and the property are just textboxs as in the demo. Yes, I follow that copying the placeholder of the client address1 field into the property address 1 field will automatically copy the text into that field. 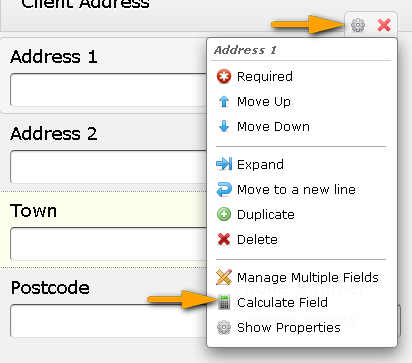 However I want to copy client address1 , address2, town and postcode to Property address1, address2,town and postcode only if the user has selected the checkbox same as address. If I try to create a new calculation it does not show the same address checkbox with the options.? I hoped by cloning the demo I could maybe just copy the fields from the demo to my form but doubt whether the calculated fields would be applied. I find your product extremely easy to set up but the calculated fields are confusing and difficult to understand. Do let us know if you need further assistance, thank you.